Shades of gray have been the “it” neutral color for years. Is the hot hue still having a moment? Or is it time to get out the paint brushes and make way for a new color? Here’s what our local professionals had to say. “I think gray will be around as a good backdrop color for a while. It is a soothing color and goes with so many accent colors. Gray and gold are a fabulous combo lately. It is truly an easy color to live with.” Carol Temple, Pizazz 2 Interiors. “I find gray to be a classic, as it always seems to be a part of any current color story. I believe it’s the particular shade of gray that will be a craze mainly because it has oversaturated the fabric and furnishings market. Gray can take on many personalities depending upon which color undertone it carries. When working with gray, I tend to lean towards a warmer ‘griege’ that is a little easier to live comfortably in, as well as locate fabrics and accessories that will complement. It’s hard for me to categorize any color as a ‘craze’ as I believe color in your home should reflect what you feel most comfortable in, whether that happens to be the ‘in’ color, or not.” Colleen Ertl, Diane Breckenridge Interiors. “Gray is the new beige, and it’s here to stay. A classic, gray has become the ‘go-to’ neutral that can work well with almost any color palette. With its endless spectrum of shades, gray has the ability to warm up or cool down a space. 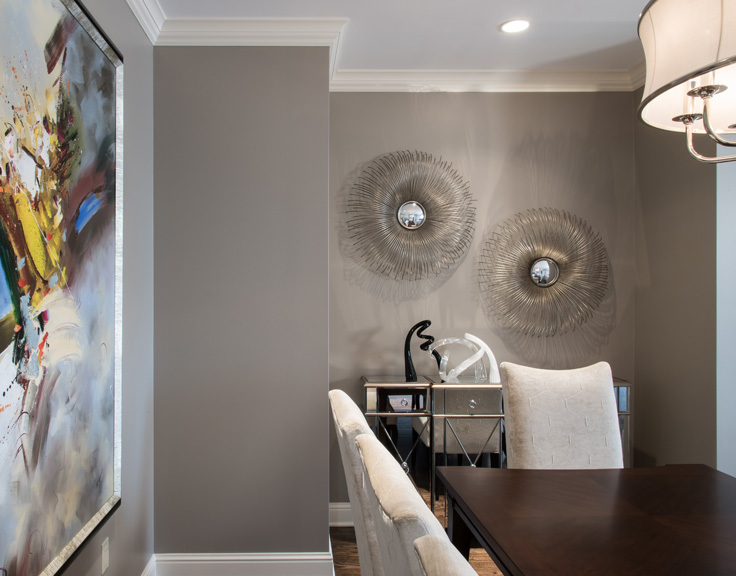 From traditional to contemporary and all that is in between, gray can be used as your accent or as a backdrop for your entire space. Its versatility makes it a classic color. “ Laura Pennington, Directions in Design. “Many perceive gray as the new neutral, which I vote to stand with. It is a strong but also subtle true color that can stand in the forefront or sit quietly in the background. Gray will stay present as the compromising choice between the bold (black) and the airy (white). Gray has proved its continued presence by camouflaging into any palette and can easily take on a new scene with each moving trend.” Ali Vernier, Carole Hiatt Design Associates LLC. “With the popularity of Carrara marble comes the beloved ode to gray. Everywhere you look people are either installing the said marble or its hardier spin-offs of quartz and porcelain in kitchens and baths alike. One of the many attractive qualities of gray is that it has both warm and cool hues. It can range in tones of green, brown or mauve. When a client brings home samples it looks completely different in their home. Thankfully the abundance of selections is plentiful and you are bound to find one that suits your house. While gray may be trending, I believe it’s here to stay.” Joni Spear, Joni Spear Interior Design. “Gray has been a very important color for the last 10-12 months, and I do not see any change in the near future. We saw it first appear in rugs, then migrated into home furnishing products; after that it has spread all over. Gray is a neutral, and placed correctly, accents the total package. I will say it is a classic, but the way it is used in so many application some could say a craze is taking place.” Ross Anzalone, Amini’s. “Gray is the neutral color that offers warm and cool tones along its spectrum. Why it is working so well in design now is because it pairs so nicely with crisp white and pops of bright colors like fuchsia, apple green, canary yellow and navy blue. Decorative tiles are making the St. Louis scene with gray-and-white tones in materials like cement and glass. Our design resources are enabling the use of this color in so many fabulous ways. Whether it be hard surface materials for bathrooms and kitchens, or the softer side of bedding, upholstery or window treatments. The versatility of the color will keep it around for quite a while.” Treasa Dolan, DC Strategies. “CLASSIC AND CRAZE. While gray is truly a classic color (think French Gray), the current gray trend is definitely a craze. Gray won’t stay this popular for much longer. We are already seeing the beginnings of the change, and I have been cautioning my clients recently to use gray sparingly and on items that can be easily changed out (i.e. wall paint, pillows). If you are dead set on a gray tile floor, choose a tile that has gray and beige and white in it so your floor will stay in style no matter what the next neutral trend is. That same idea can translate into your backsplash, area rug or fabric. Use the trend as part of a mix, rather than your primary color.” Marcia Moore, Marcia Moore Design. “I feel that gray is a very nice neutral color. However, I believe it is a craze because the color palette in interior design is constantly changing and has a great deal to do with the national economic standing. Deep, dark colors tend to be popular when the economy is suffering. Light colors seem to be more popular when the economy is good. Deep colors are comforting. Light colors are invigorating.” Tom Manche, Tom Manche Interiors LLC. “The gray color is a craze! Typically trends last about 10 years, and we are about eight years into when gray took off where we mostly found it on walls; from there it went to accents in art and accessories and grew into it being everywhere including cabinetry. We are still in the gray trend right now but are heading towards the end of it. I think that over the course of the next two to three years we will no longer see as much gray, and we will start seeing more white walls with colors coming in through the furniture and accessories. If you are looking to do a remodel and want to ensure it does not go out of style, stick to the classics. Shades of white are great backdrops for all of the upcoming trending colors.” Candice Wideman, Youtopia Designs.